Use in situations where binding via a datacontext is not possible. Windows Forms is a perfect example of this. In order to separate the view from the model, a presenter is needed. Since the view cannot directly bind to the presenter, information must be passed to the view via an interface (IView). But I have not found a single article which discuss the difference theoretically along with sample code. It would be really nice if i get a article which discuss the difference between these 3 design patterns (MVC, MVP & MVVM) along with code. I'd like to get my hands on source code of 3 similar CRUD apps which has been implemented by these three design patterns (MVC, MVP & MVVM). So that I can go through the code and understand how one should write code for these three design patter (MVC, MVP & MVVM). So if any such article exists which discuss how code would look different for these 3 design patterns (MVC, MVP & MVVM) then please redirect me to that article. This should be a good starter. In reality, your chosen 'platform' also plays a large role in how you use these patterns. For example, MVVM is naturally suited to WPF, while MVP works well with Windows Forms. ASP.Net MVC speaks for itself. Controller: Controls the interaction between Model and View, where view calls the controller to update model. View can call multiple controllers if needed. Similar to traditional MVC but Controller is replaced by Presenter. But the Presenter, unlike Controller is responsible for changing the view as well. The view usually does not call the presenter. The difference here is the presence of View Model. It is kind of an implementation of Observer Design Pattern, where changes in the model are represented in the view as well, by the VM. Eg: If a slider is changed, not only the model is updated but the data which may be a text, that is displayed in the view is updated as well. So there is a two-way data binding. The input is directed at the Controller first, not the view. That input might be coming from a user interacting with a page, but it could also be from simply entering a specific url into a browser. In either case, its a Controller that is interfaced with to kick off some functionality. There is a many-to-one relationship between the Controller and the View. That’s because a single controller may select different views to be rendered based on the operation being executed. There is one way arrow from Controller to View. This is because the View doesn’t have any knowledge of or reference to the controller. The Controller does pass back the Model, so there is knowledge between the View and the expected Model being passed into it, but not the Controller serving it up. The input begins with the View, not the Presenter. There is a one-to-one mapping between the View and the associated Presenter. The View holds a reference to the Presenter. The Presenter is also reacting to events being triggered from the View, so its aware of the View its associated with. The Presenter updates the View based on the requested actions it performs on the Model, but the View is not Model aware. The input begins with the View, not the View Model. While the View holds a reference to the View Model, the View Model has no information about the View. This is why its possible to have a one-to-many mapping between various Views and one View Model…even across technologies. For example, a WPF View and a Silverlight View could share the same View Model. Not the answer you're looking for? Browse other questions tagged c# design-patterns model-view-controller mvvm mvp or ask your own question. 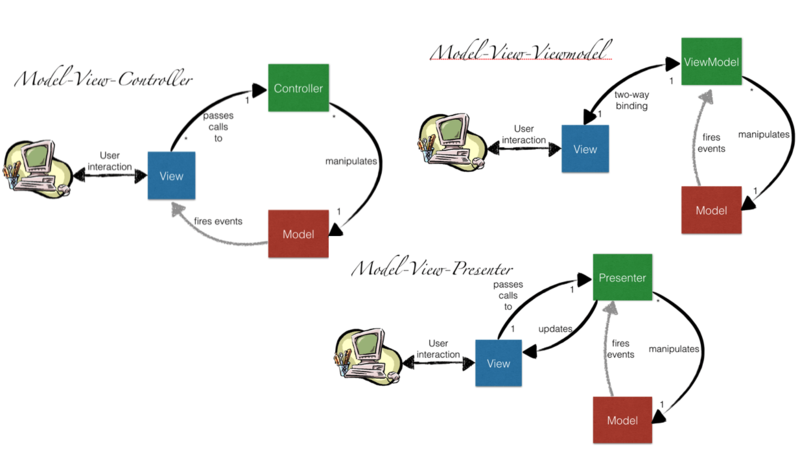 What are the differences between Presenter, Presentation Model, ViewModel and Controller? Is WPF the best solution for C# GUIs? Should a controller access UI components? What exactly am I using? 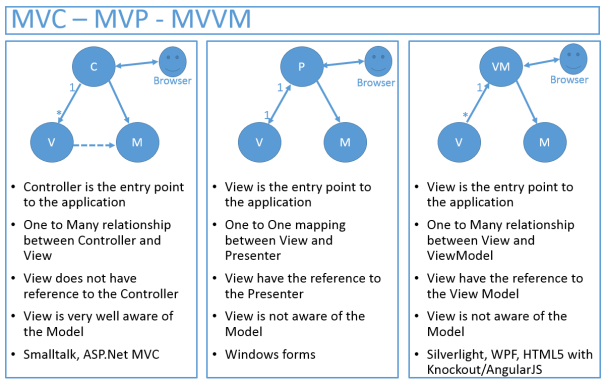 MVC / MVP / MVVM What the Heck?